Julian Bell, curator at the Weald & Downland Museum, is giving an illustrated talk about how they work with and reconstruct the buildings. Julian has handson experience of working on the buildings himself. A figure of eight walk through the Rother Valley, starting in Woolbeding and taking in Stedham Mill, Bridge and Church. A gentle 2-hour Sunday stroll of about four miles. Dog friendly (you’ll need a lead), children welcome (no lead required). We will be there, serving up ‘Fernhurst fairings’ (see page 3) and displaying books and images from the Fernhurst Archives, Ken Ouin’s model of a Tudor house and W A Madgwick’s map of Fernhurst between 16th and 19th century. The last ‘Cow’ and ‘Cattle Crossing’ road signs in the village are now in the Fernhurst Archive; signs that are no longer needed on our roads - a sign of the times. In recent memory, in the last half century, there were a mass of dairy cattle throughout the village from east to west, north and south. Some were small herds milking only a few; others milked up to 250 with 200 followers. One was a prize winning Jersey herd belonging to Eileen Trusted at Hoewyck – an OE word meaning a dairy farm on the side of a hill; others were a mix of Guernsey and other breeds producing less creamy milk. Eileen advertised this very special herd for sale on December 5 1957 in Country Life. Our cattle crossing signs are associated with the largest, and last, dairy farm which closed in 1996 when Mark Cam gave up the dairy herd his stepfather had started at Lower Lodge in 1965. Anyone here in those years will remember the herd walking slowly along the Milland to Fernhurst road for milking. The decision had to be made as to whether you sat and waited for them to pass or tried to drive through them. Both had the inevitable drawback of being too close to a cow when she did what cows inevitably do! Mark milked up to 250 cows, and even in the early 1980s one could go there with a jug and collect milk or delicious cream. At Becksfield to the west, the Palmer family started milking in 1956 by hand, with Richard and his father having a milk round and selling eggs. 60 Head at the end with a dozen or so followers had to go when the dairy was given up in 1995. Bob Marriner, south of the village, also had to cross the road with his herd for milking. That was the A286, and the delay proved very unpopular with the hurrying and harrying commuter. His great grandfather William had started milking 10 cows by hand in 1944 or 5 but, as machine milking came in, the herd increased in numbers up to 120 with 40 followers. Plant Protection also ran a dairy herd at Home Farm and Courts Farm. This was started commercially shortly after the war but finished in the middle 1970s as different ideas became more important to research. 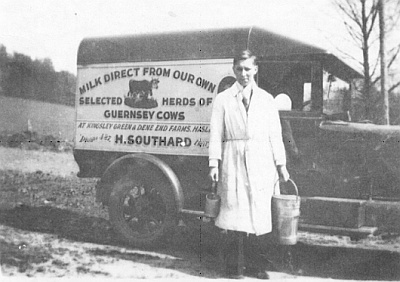 At Kingsley Green William Herbert Southard dairy farmed around 50 Guernseys, starting the herd for Sir Ernest Myer who lived at Whitehanger just after World War 1, before taking over on his own in 1930, keeping the cows at Chase Farm. There were still however a few Jerseys at Kingsley Green and their stalls still had their names up when the house and land was sold in the early 2000s. From about 1950 to 1965 Mr Conochie processed some of the milk in the old dairy in Church Road. He installed his own bottling plant, sold the milk, butter, cream, eggs and possibly ice cream from the window in his house next door. Other small herds were run by the Cook family at Colliers and the Uppertons where the Marches now are. Even in the 1980s a family on the Green kept a house cow for their own milk; but that is a thing of the past at the moment. Cows are few and far between in the parish where land is given over to polo ponies and sheep! If anyone can correct and add to these facts, or have any photographs we can scan, we will be delighted, please let us know by phone, email or snail mail. This year we’re ‘reintroducing’ biscuit fairings to Fernhurst Revels on 15 May. Local resident Bic Bicknell has made us a couple of circular beautiful biscuit stampers from wood and they work perfectly. Up until the 20th century it was customary to buy ‘fairings’, at fairs throughout England, for luck. A fairing was a piece of gingerbread or a ginger biscuit formed in a mould to a shape, or stamped with a design, and frequently gilded. The moulds were often large and intricately patterned. The earliest written record of fairings dates back to St Bartholomew Fair in 1126. In medieval times the gingerbread was made from breadcrumbs, spiced and bound with honey and stamped with a religious image. Ingredients included a variety of available spices and candied fruit and sometimes almonds. As time went on, Kings and Queens took over from the religious motifs and in the 1800s you could get fairings in an even greater variety – animals, birds, flowers and famous people such as Wellington on his horse with pistol and sword (Brighton Museum). Lillian Candlin, a collector of Sussex customs and folklore, mentions in her book ‘Memories of Old Sussex’ that a fair closer to us, in Egdean near Petworth, in 1796 was overwhelmed by a storm of rain. The importance of the fairings was significant enough for the local paper to report that: ‘All the gingerbread sellers sustained considerable losses as canvas coverings were by no means proof against the excessive hasty showers which made such havoc among the kings and queens’. The kings and queens were gingerbread fairings. The blustery May downpour sounds rather familiar. Whatever the weather, do come and pick up a Fernhurst Fairing from our Revels stall. In the last newsletter we reported the visit from Canada of Murray Trusler and his wife Sharon. The Fernhurst Archive helped Murray discover his roots and put him in touch with John Trussler (Fernhurst Society member living in Berkshire). Canadian Murray and English John are descendants of John Trusler and Ann Nash who, having married in Chiddingfold, settled in Nightingales on Bexley Hill in 1795. In the story below John Trusler and his descendants keep one ‘s’ in their surname.GeorgeTrussler’s family use two. The brothers John and George Trus(s)ler and their large families travelled together. At that time John and his wife Jane had about 10 surviving children and George and Elizabeth had 7 surviving children. They sailed on the England (chartered by the Petworth Emigration Scheme) which set sail from Spithead on 25 April 1833 and arrived at Montreal on 20 June 1833 where they boarded the United Kingdom on 29 June to head up the St Lawrence River to York (now Toronto) en-route to their planned destination. By all accounts the whole trip was horrendous. Of the 160 odd who set off on the ‘England’ only 80, including John and Jane Trusler and family, arrived at the final destination of Henry Jones wharf, St Clair River near Camlachie, Sarnia, Ontario. They were all very unhappy already but nothing had been prepared for their arrival in spite of the assurances given before leaving England. John and some of his older sons set off about 16 miles away to clear the forest and build a log cabin. Jane and the younger children had to stay at the Wharf and their two youngest children died there, possibly of Typhus but hunger was rife. Walter was about two years old and Obadiah was an infant who could have been born on the journey or at Henry Jones Wharf. If you’d like to know more about local family history, please email the archive archives@fernhurstsociety.org.uk or drop in on a Tuesday afternoon between 2.30pm and 5pm. We are trying to investigate a romantic wartime love story. The new owners of Keeper’s Cottage discovered a cache of love letters and, with only the name ‘Kenneth’ to go on, assumed that they belonged to Helen Ouin. They were not hers, so she has returned them to us to see if we can reunite them with their rightful owners. The writer was in the Royal Artillery (88/12 Medium Regiment). In January 1944, he was based in Mickley Northumberland and also wrote from the Army School of Medical Warfare (subsequently Porton Down) where ‘They gave us whiffs of various obnoxious gasses include phosgene mustard but in very harmless doses’. Please contact us if you have any idea who ‘Kenneth’ might be. Thanks to the vast knowledge of Robin Ellks, we are learning a lot more about Kingsley Green. He was able to help with information and photos of Roundleze, that stood where the aslemerebound bus stop now stands. While he and Iain Brown were poring over his and our maps of Kingsley Green, Darren Wells, our sometime metal detectorist, also came in with a Kingsley Green enquiry about a mysterious site – a garden with concrete paths or a WW2 construction? Thanks to Judith Turner’s efforts we acquired some redundant street furniture in the shape of cattle crossing signs (see page 1). Elizabeth Lockwood of Camelsdale donated (via Sue Hodge) a Christmas 1916 Fernhurst Parish News, a Haslemere Herald from 1969 with a feature on the Mills family on the front, a 1967 election poster and a rather splendid welcome home certificate presented to Leslie Mills by Lynchmere, Hammer and Camelsdale Peace Committee thanking him for his service in the Great War. Robin Barnes has given us some Vanlands estate details. When Archive team members, Kathleen Bird and Brenda Newman, showed ‘Fernhurst in the 1940s’ display boards and memorabilia to the Good Companions as a way of re-awakening old memories and provoking discussion, Ken Newman mentioned that his mother had a china ornament with ‘a gift from Fernhurst’ on it, which he is going to let us have. Rosemary Foster has given the Archive her notes of talks she had with various members, which we believe will provide us with some new material. Subsequently Christine discussed with her the possibility of the Good Companions having a ‘Fernhurst in the 1950s’ session this time next year, as we have very little from the period. That could then form the basis of another presentation and display to the Fernhurst Society in 2017! It was an unusual talk to the start the year - not what I was expecting from the title. I introduced the speaker Dr Caroline Adams, a Sussex historian and archivist, and mentioned that people had suggested that modern domestic bliss included running hot water, decent heating, windows that close, good fresh food and possibly separate beds! Dr Adams said her talk was not really about that, and it was not. 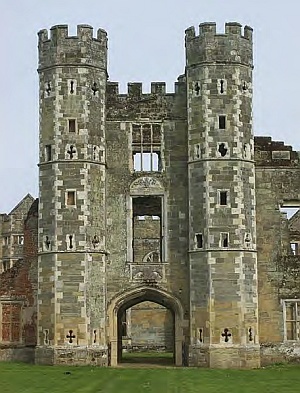 The talk centred around Cowdray House of 1682; and the Arundel, Petworth, Parham, Stansted and Wiston estates. The owners of these large houses were either keen to entertain royalty and aristocracy or pressured into doing so. The requirements of domestic bliss in this talk were sufficient servants and rooms to cater for the retinue that accompanied your guests and an upto- date gatehouse of a suitable calibre and style to welcome royalty. The size of the house and number of servants required for domestic bliss were specified by a member of the aristocracy in 1609. The list of rooms was endless! Dining rooms, bedrooms, storage rooms, kitchens, bakehouses, and rooms one has never heard of let alone canvas accommodation for particularly large retinues accompanying royal and aristocratic visitors. Flexibility in the use of the rooms was essential, and it seems they could be used for different needs as the situation arose. Around 300 male servants were needed, from Gentlemen waiters upwards and downwards, with the most important steward being in charge of everything in the house - paying, hiring and firing, food orders - and outside including the very pale, or fencing, around the estate. No mention was made of female staff inside or out – they just didn’t exist in the records Dr Adams uncovered. The important 'gentlemen' servants, including the stewards, came from other good families and had amazing responsibilities for their young age (late teens, early 20s). Being a steward was just a step in their training and from this grounding they would go on to study law before taking on responsibilities on their own family’s estate. host, Sir Anthony Browne, who tried to deter her. If you’d like to submit an article and/or a photograph for the newsletter, please contact Elaine via email enquiries@fernhurstsociety.org.uk. We can’t guarantee that we’ll publish it but we’d like to have your contributions on village life (past and present), local nature, walks, buildings, customs, memories and folklore whether you’re 5 or 95.